What if you no longer want your week? Have you been thinking of disposing of your week? If so, you should know the following: As owners of deeded property, it is your responsibility to sell it, but the association can help you in two ways. First, you may list your unit for sale on this website where other owners and the public may see it. Click here to fill out the online form to request to List Your Week for Sale. Be inventive and look towards younger folks especially, because, as you know now, the true value in timeshare is in the use. Make selling a project and see if you can't get it done. The second way your association can help you is that If you find a willing buyer the association will do the paperwork for a fee of $250. You would need to put the potential owner in touch with us so we can get all the pertinent information from them (correct name(s) and address, etc...) and of course then you would have to sign the deed in front of a notary to transfer your week to the new owner once we approve the new owner for ownership. Words to the wise: Do not pay anyone anything up front to sell, appraise, or otherwise advise you about selling your unit. Their true percentage sold, once you get through the smokescreen of their promises, is abysmally low. Please do your utmost to put this property into the hands of someone who will use it. Look for inexpensive places to list your property for sale: church bulletins, local papers and periodicals not to mention the opportunities on the internet. There are dozens of ‘postcard’ companies out there claiming to be helpful to owners who are looking to be done with their timeshare. I have not found an honest one yet. They are largely predators who try to scare you into thinking your property has no value. At some point in your dealings with them, the tables turn and suddenly you are being expected to pay them a considerable sum to be done with your timeshare. If you are at the point or have contacted one of these companies, stop. What these scoundrels do is to create a phony, usually offshore, corporation and deed your week into some shell company called, “WorldWide Vacations” or “Timeshare Trade-Ins” or some such name like these. Then they don’t ever pay dues! It’s a fraud, pure and simple, but the law is slow, like it always has been about timeshare protection. They send 100,000 postcards; get 1,000 responses, collect $2,000 each and walk away with 2 million bucks for an investment of a few thousand dollars. So, before you pay some scoundrel to harm the association, strongly consider selling, or giving it away yourself. Under certain circumstances, for a minimum fee of $2,000 the association will take your week back and handle the paperwork correctly to completely relieve you of future obligation. 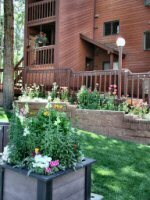 E-mail me at info@indianpeaks.org, or write to me at Indian Peaks, P.O. Box 360, Fraser CO 80442. I must have something in writing from you; I cannot take action over the phone.